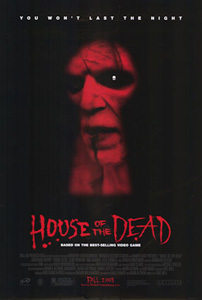 House of the Dead is a serious contender for worst film ever. The film is based on the game of the same name, which gives some cause for concern, as the game is a brainless shooter with no discernible plot. Sadly the film does remain faithful to the game in this regard. An awful pasted together series of ripped off scenes, ridiculous dialogue and laughable attempts at acting are brought together here by demented director Uwe Boll and it is painful to endure. I recommend you never watch this and I would be prepared to pay money to ensure that everyone involved with this film never gets the chance to pollute my viewing again.